How To Use National Read A Book Day Wristbands? How To Use Read A Book Day Wristbands? Celebrate National Read A Book Day With Custom Designed Wristbands! Custom-made bracelets can be designed with your wish message. September 6 is National Read A Book Day, a day where people, whether avid book readers or not, open up a book and read for an entire day. Instead of indulging in technological entertainment, crack open a good book and reserve time for some reading! Reading is not only good for entertainment purposes—it also improves memory and concentration. By stimulating your brain in this way, cognitive decline can be slowed as you age. So while you take some time to read on September 6, sport a National Read A Book Day Wristband! 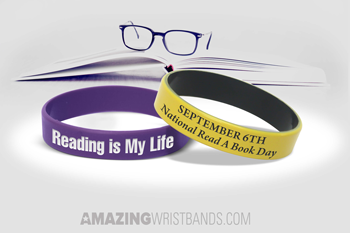 Remind everyone about National Read A Book Day when wearing these wristbands. Sell these wristbands or give them as gifts at book clubs and libraries. Encourage others to read with custom wristbands! Give a custom wristband to a reader in your life. • Add different colors, images, and designs to your wristbands—even images of your favorite book! • Add different effects such as glitter and glow-in-the-dark! • Different sizes and styles are available. Why Buy National Read A Book Day Wristbands From Us? Amazing Wristbands is a leading provider of customized silicone wristbands available online. Our bracelets are comfortable, durable, and non-allergenic, made of 100% silicone. Many of our wristbands can be created with our easy-to-use online builder to create your personalized wristbands. Or, call us and our professional and friendly customer service agents will help you. In addition to standard wristbands, AmazingWristbands.com also offers super popular slap bands that “snap” to a person’s wrist, as well as half-inch bands, thicker one-inch bands, adjustable bands, USB bands, amazing custom silicone rings and silicone key chains. 100% Silicone Wristbands for your awareness campaign. NO MOLD FEE on any quantity of custom wristbands. FREE Shipping for wristbands in the U.S.
FREE artwork and design for your wristbands. Get a detailed quote for your National Read a Book Day wristbands in minutes!